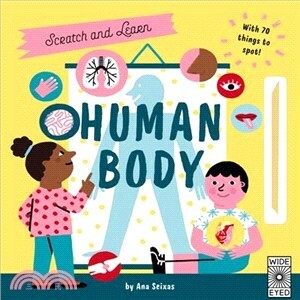 See the human body as never before, in this unique scratch and discover format. Every spread addresses a new theme, teaching little ones about about our skeletons, muscles and brains! An appealing, interactive first introduction to the world with activities to help understanding. Ana Seixas is a Portuguese graphic designer and illustrator whose work is bold, humorous, and child-friendly. She has worked as a freelance commercial graphic designer for businesses, art galleries, and magazines, and now dedicates most of her time to screen-printing and illustration. She is based in the beautiful city of Porto, where she lives with her two cats.